For classical music novices, there’s a lot to absorb when attempting to enjoy the genius of Leoš Janáček. First, there’s the unfamiliar name, Yah-nah-chek. Then there are other matters to consider: His erratic composition style. Or how he repeats tiny bup-bup-bups of rhythm to build musical thoughts that are lyrical, yet not easily hummed. Sir Mark Elder seems energized by those challenges when he describes Janáček’s “fire and freedom,” elements of the Chicago Symphony Orchestra’s Beyond the Score program on March 11 (with a matinee repeat on March 13). Ahead of the two Beyond the Score presentations, Elder will lead the CSO in subscription programs March 3 and March 5 (featuring works by Vaughan Williams and Elgar) and March 10, 12 and 15 (with works by Janáček, Dvořák and Bartók). To unfamiliar eyes and ears, Janáček’s music can be an awkward and bewildering experience—the antithesis of the romanticism often embodied by fellow Czech-born composer Antonin Dvořák. “Some people are afraid of it,” Elder said. Yet beyond the unconventionality lies an irrepressible passion, and that is what Elder and Gerard McBurney, CSO creative director, aim to sort out and tap into with Beyond the Score. In the 1950s, noted Janáček interpreter Sir Charles Mackerras was able to solve the puzzle and get to the heart of the music. He recognized that all those tiny note values added up to something big and deeply emotional. “Charlie was absolutely right: Janáček was our first minimalist composer,” Elder said. 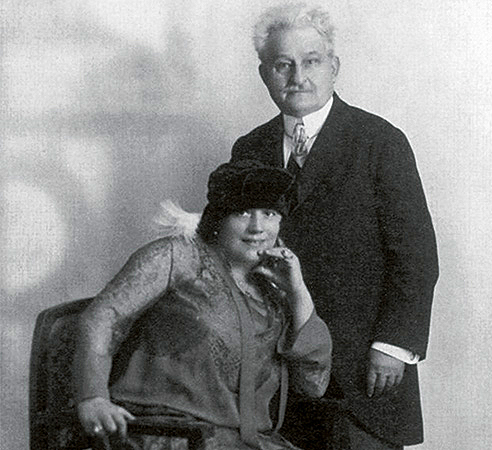 After meeting Kamila Stösslová in 1917, Leoš Janáček became obsessed with her, and she inspired some of his greatest works. Coursing through these works is the equally interesting character of Janáček, who did not really thrive as a composer until he reached his 60s. The reasons for this late bloom can only be surmised, and Elder and McBurney promise to dish about that in the Beyond the Score program. In the end, Elder notes, Janáček’s work serves as a fitting coda to his life. After the smoke of deadly battle clears in Taras Bulba, the music soars upward in a hymn to a brighter future. Music from the final scene from The Cunning Little Vixen, where the fox meets her certain demise, was played at the composer’s public funeral. Rightly so. Joe Pixler is a Chicago-based arts writer.